Mayonnaise is problematic in a whole food plant-based diet for two reasons: 1) it’s traditionally made with eggs, and 2) even vegan mayonnaise is usually made with oil. 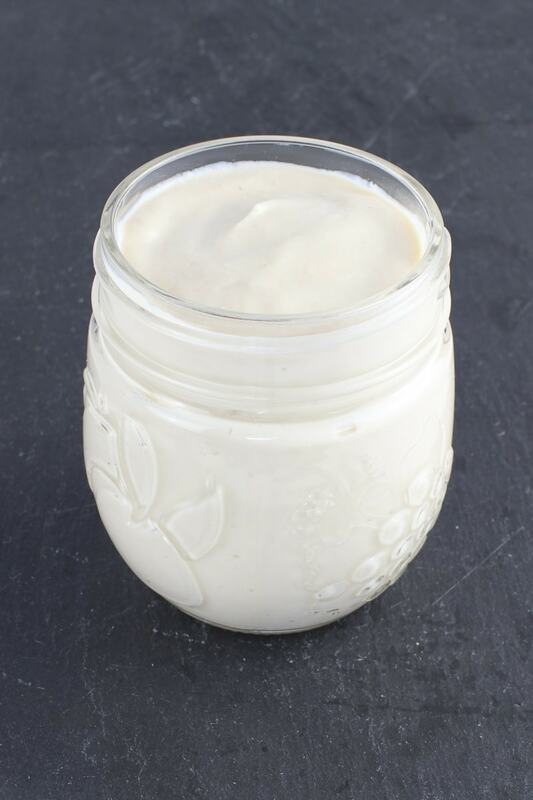 You can buy oil free mayo made with eggs. Or you can find egg-free mayo made with oil. But so far, I’ve yet to find a Vegan Oil Free Mayonnaise at the store. So–as with many other WFPB foods–we’re left to make our own. I suppose you could get away without ever eating mayo. 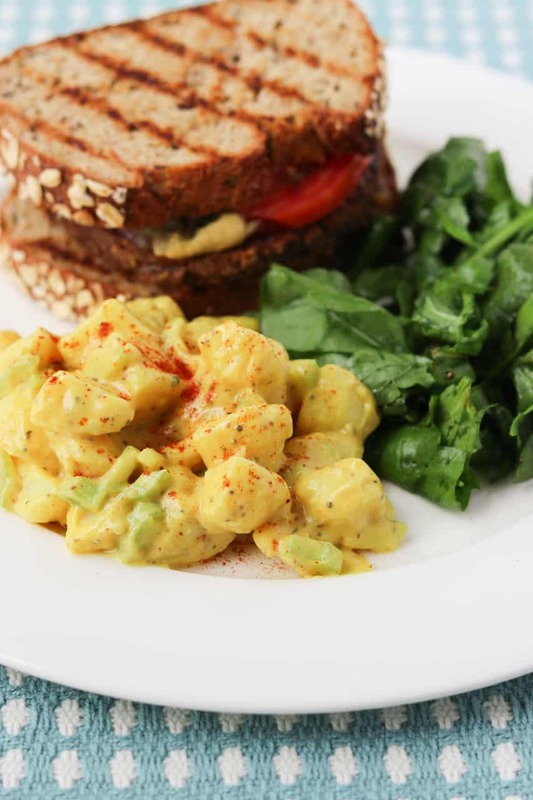 For example, I skipped mayo altogether in my Vegan Egg Salad recipe and used avocado instead. But it’s a key ingredient in so many of the traditional recipes and dressings I grew up with–like my Grandma’s potato salad–it’s kind of nice to have a healthy, plant-based version on hand. While creating this recipe, I ended up with four versions: 1) vegan oil free mayonnaise made with tofu, 2) vegan oil free mayonnaise made with cashews, 3) vegan oil free mayonnaise made with tofu + garlic—otherwise known as vegan aioli, and 4) vegan oil free mayonnaise made with cashews + garlic—also otherwise known as vegan aioli. I created the original recipe with tofu, and I like this version because it’s tasty, budget-friendly and low in fat. But, I know some of you can’t eat soy, so I created a second version made with cashews. This version is richer, with and a slightly milder flavor. It’s also more WFPB compliant, as it avoids the processed tofu. 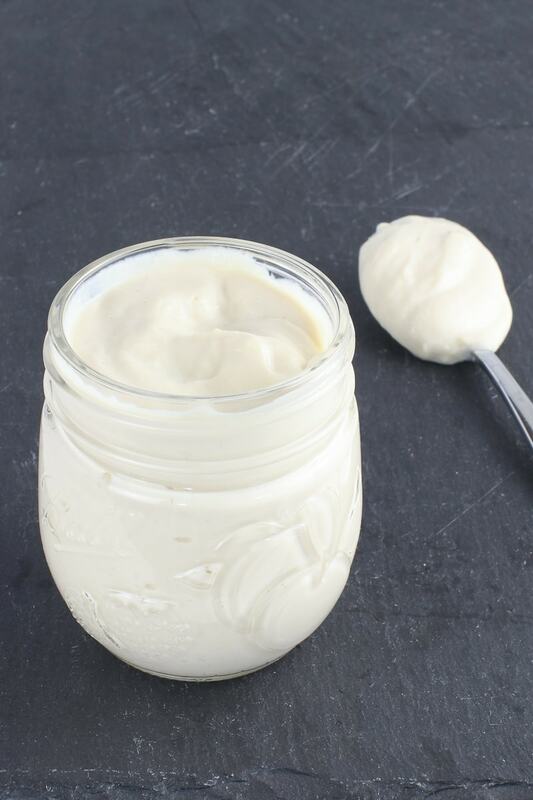 Playing around with this vegan oil free mayonnaise recipe got me thinking about how much I love aioli, which is similar to mayo, but made with garlic. While mayo is great as a base in recipes, when it comes to a sandwich topping or a dipping sauce, I prefer aioli. Am I alone on this one? 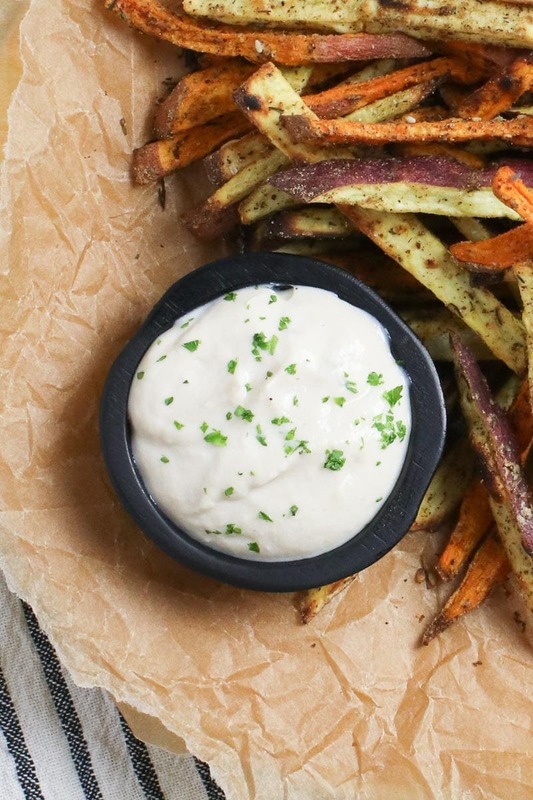 I love dipping crispy veggies–like my Oil Free Baked Za’atar Fries–into a little pot of creamy, tangy, garlicky aioli. 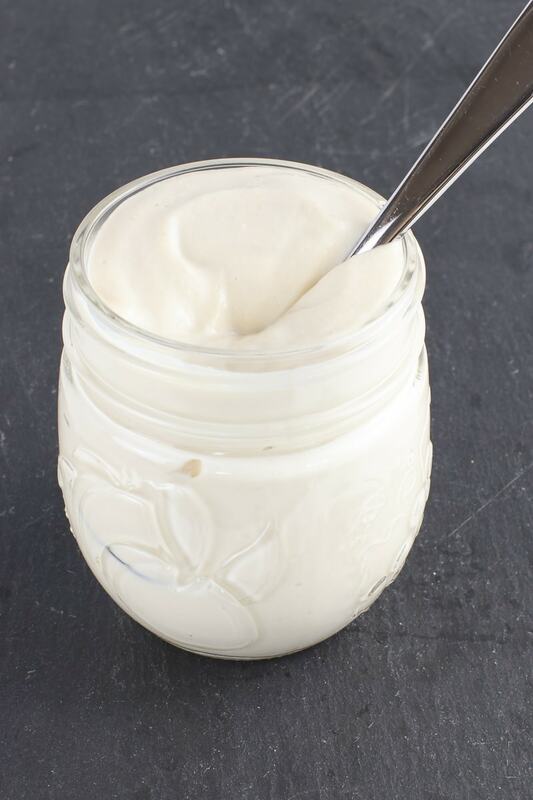 In this recipe, converting vegan oil free mayonnaise into aioli is as simple as blending in some well smashed raw garlic. Either way–mayo or aioli–I like to let it sit in the fridge for about 30 minutes to fully marry the flavors. Of course, you can eat it right away if that needs to happen. I get sometimes this needs to happen. Note: The tofu version will last about 3 days in the fridge, and the cashew version is good for about 5-7 days. They both freeze well, so that’s an option too. 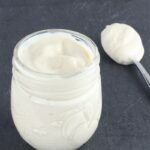 Vegan Oil Free Mayo - 4 Ways: 1) tofu mayo, 2) cashew mayo, 3) tofu garlic mayo (aioli), and 4) cashew garlic mayo (aioli). 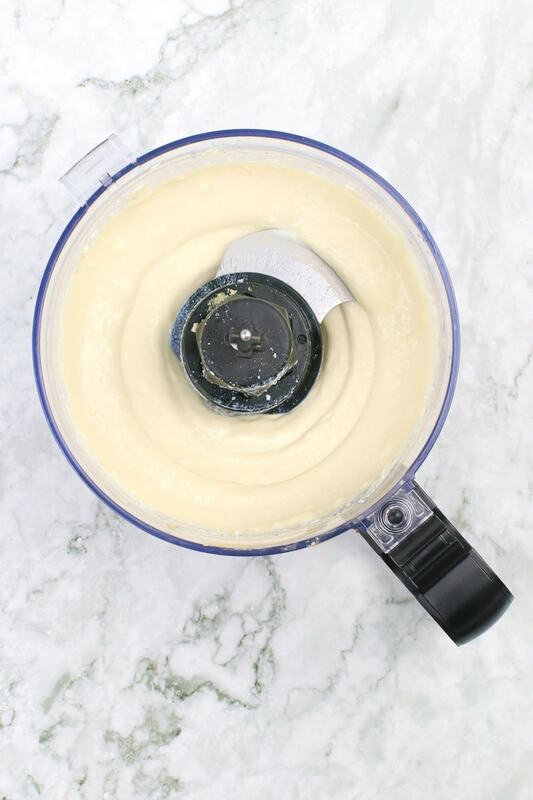 Place all of the ingredients in a food processor (or a blender, if making the cashew version), and process until smooth and creamy, about 1 minute. For the best flavor, allow to rest in the refrigerator for at least 30 minutes. Kala namak, or Indian black salt, is optional but highly recommended. It has a mild sulfur flavor (like eggs) that makes it taste more like 'real' egg-based mayonnaise. Nutritional information is approximate and is shown for mayonnaise made with tofu. You are not alone. 🙂 Dipping deserves aioli all the way. Right?! I’m with you. Aioli is the best! This mayo sounds so yummy and like a fantastic preservative free option compared to store bought. Will definitely be giving this a try! Thanks for sharing this grest recipe. Thanks so much Rosa! I don’t know about you, but I can easily find vegan condiments and sauces at the market, but WFPB is so much more challenging. So I’m finally getting around to developing my own recipes for them. I played around with this one for quite awhile before I landed on a recipe that really tasted good. I hope you like it! May I ask how long it lasts in the refrigerator please…many thanks.. The tofu version lasts a few days in the fridge, and the cashew version will last a week or more. They both freeze well, too! Thanks for the question–I’ve been getting this one on social media too, so will update the post with this info!